Speaking at a public meeting in the Bodden Town district hosted by his fellow MLA Anthony Eden, McLaughlin said that the National Security Council’s crime strategy report, which has finally been revealed to members of the Legislative Assembly, contains import information and potentially long term solutions, but no immediate solutions to protect people from the surge in robberies. The document, which has not yet been adopted by Cabinet, addresses the root cause of crime and the social issues that have fuelled its increase. The report, he said, was a comprehensive look at failures where children are concerned, programmes that have not worked, and a lack of rehabilitation in the prison system, all of which he said were important. “The report deals with the causes of crime, and there is much that is good in the report, but in the short term we have to deal with issues that confront people on an almost daily basis,” McLaughlin stated. With four bank robberies in just over one year, none of which have been solved, the people were scared and the robbers were facing no deterrent as they were being rewarded for their crime, he added. 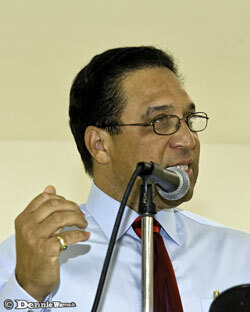 “We need an immediate plan to deal with the crime that is facing us every day,” McLaughlin told the district audience. He said the most recent statistics from the RCIPS showing a decline in overall crime did not reflect the reality of how people felt, and with a more than 200% increase in robberies the overall reduction did not instil confidence as it was these crimes that were frightening people. He said the question had to be how can the safety of customers and staff at a bank be ensured if someone can walk up to a security guard and put a gun to his head and rob the customers? “We have to accept Cayman has changed,” he added. Echoing the sentiments of the community as a whole, he said it was only a matter of time before somebody gets seriously hurt or killed during a robbery. Crime is nothing new, he noted, but said Hurricane Ivan was the watershed for the Cayman Islands when it came to social behaviour and crime. In the wake of the disaster the island witnessed lawlessness and criminality never seen before and it had been difficult to get the genie back in bottle. He pointed out that the previous government had focused on addressing crime, especially with resources, despite it being the responsibility of the governor. With the introduction of the National Security Council under the new constitution, he said the elected armed of government now had more power as the government was bound to take the council’s advice. “The government is playing down its role on national security so it can avoid accepting responsibility,” McLaughlin said. I’ll tell you what is a crime. That fence not being repaired yet is a crime. That is what Alden needs to be focusing on. The people will not relent until the work is complete. Mark my words! As in the political Arena no changes have been made it can be said for the RCIPS same old tired people in the RCIPS with the same old tired strategy with the same old tired excuses. We were promised change and it never came and so crime continues. As for the innocent officers comment only the guilty know what their guilty of yet it does not explain the anomaly of those who presumably past the polygraph test. The problem has always been no proper screening process for those who have joined or “gone bad” who simply then join the old boy network and is then immune to scutiny or question. Stop complaining Cayman and do something about it. Alden, for once, appears to have a point. The problem is he hasn’t got the stature to press it. Maybe hiring a bulldog would solve the ‘problem’? Why does he need to hire one, when he has one already in the PPM. Right. Now if we could only get one on the UDP. ..the island has seemed to have won a small respite from the internecine strife that went on last year and for a few years before that, only to have it replaced by bank and shop heists! !…I will presume the reason for the decrease in the first category has to do with the fact that many (and there are really only a meagre few!) of the young psychopaths (in reality, young fatherless lads, raised only by their well meaning single parent moms,(who chances are , had no fathers of their own!) without meaningful imput from a male role model, preferably a functioning father!) have either left the jurisdiction or, are presently being incarcerated pending trials etc. Thanks be to God for small mercies! The second “group” or category of criminals have certainly got their act together, if their recent rates of success can be used as a yardstick of their eptitude, managing to get away scott free, after conducting brazen “prime time” robberies in broad daylight. Either they are consumate/professional “smooth operators” or, the rest of us are bumbling scaredy cats, and that includes everyone concerned, from the common citizenry, the police,all the way up to the politicians of the day. If we say we really want to rid ourselves of the scourge, then EACH citizen has to become involved and “police” our community. For instance,when a robber leaves his latest “site”,maybe we should attempt to follow them/him at a safe distance! You never know what you might be able to see/witness.The lawmakers need to bite the bullet and pass laws that allow our police to respond appropiately to armed individuals,i.e with arms that are within “arms reach” and to aggressively “harrass” any citizens that are suspected of involvement in these crimes. Yes there may be cases where an “innocent ” is subjected to some unwelcomed interogation etc, but it may just be the price that we the suffering public might have to pay to address this issue effectively. Remember, there are NO free lunches, and we get only what we tolerate!! God Bless the Cayman Islands…and the rest of this suffering World! More yap, yap, yap from both Political Teams….with still no clear immediate plans/solutions. As i and many others have posted many, many times already: Train and Arm the Police and other reputable Security Personel and Law Abiding Residents! McLaughlin has lost his credibility. How can he justify the expenditure on schools that has been the cause of our economic woes as a result of his doing, and created the historic cut in civil servants pay? When people tried to advise him to stagger the schools implementation he dismissed them. This is the pot calling the kettle black. Actually the kettle IS black compared to the pot. Does the profession of law equate to good leadership? McLaughlin created the cut in civil servants pay but somehow we are able to still spend extravagantly on hurricane shelters, create new positions for the personal ease and comfort of Deputy Premier and lavish foreign trips for UDP members? How much was saved by the salary cut versus these expenditures? Something does not add up. Methinks you are trying to change the subject. The people are not so gullible that you need only to mention “expensive schools” and any further scrutiny of the current govt’s policies is suspended. You are insulting our intelligence. Wasn’t Kurt and now Alden on the National Security Council??? Same old tired PPM crap…Where’s the new blood? The new blood appears to be the same old tired new blood. Just let us all have guns. It’s far too late for any other solution. Welcome to Cayman’s change into Tombstone Arizona circa 1881 (i.e. the days of the gunfight at the O.K. Corral), where the law and the outllaws struggled for supremacy at the points of each other’s guns. Oh wait… they let the lawmen have guns back then.. OK, maybe that’s why the outlaws are winning here. do what sheriff ken jenne did; hold meetings with the command staff regarding their areas to reduce crime and hold them responsible use a point grading system to rate the crimes each month starts at 100 and reduces if crime does occour, he might be a bad example but he got the job done. how many of the command staff of the police are actually on the street, or at the road checks at anytime? What a thing eh!! Every Government blames the next government for crime. Crime excalated in 2005. Who was responsible for it then? This is the same crime, same people committing the crime –Now come on Alden!!!! !, Stop the power shooting and help find a solution. You did nothing ,to prevent today’s crime. Where is the result of your strategity. Never had one!! You all better get together and help solve this country’s crime problem, because all of you are guilty. When in 2005 PPM was in it was McKeva crying to you to stop the crime- now it’s just the reverse. The bunch of you makes me sick. ‘We’ can’t just simply rename a person, remember? Besides, Alden McLaughlin sounds perfectly fine to me. I’m tired of these politicians blaming each other for crime and everthing else. Out with the PPM and the UDP. Cayman if we keep re-electing the same people and playing musical chairs in the Cabinet Room how can we expect different results ? Lets go with the third group……..just do it Cayman. It is hard to guage from the reporting published here, but I suspect the scope of the report was only ever designed to look at the long term fundamental reasons behind crime. I am not sure the report was ever billed as being a “quick fix” as the opposition are demanding. Of course a quick fix is nice in theory, but thats been the problem with the politicians for years. They never looking at long term solutions, just short term feel good solutions. Not the best way to lay the foundations of a future successful country. Nice try at deflection. McLaughlin is obviously not saying that we should not look at long term solutions but instead that they are not sufficient when there are urgent immediate needs that are not being met. I attended the meeting last night…….the PPM is dead my friends. Chuckster lets get the show on the road. Ezzard and Arden its time to put action to your words and lets get our country back on the right path. Moses you need to join this new mission too. Tell us what you would do to deal with the crime problem Alden. Being the opposition is so simple eh ! Just oppose and offer no solution. Get out the brooms Cayman !!!!!!!!!!!!! Please Alden sit down. You are but a smaller version of Kurt ! Here comes Alden again whining and complaining but devoid of any solutions. Where is your solution Alden ? That you would “have pushed” on this issue. Please Alden you and your buddy mentor, Kurt, don’t exactly have a reputation for pushing do you ? No sah…..whata mess we in !!! Staggering ineptitude from Cayman’s leaders. We face an acute problem with violent crime. We need swift, decisive leadership to improve the safety of Cayman. Instead we get a bit of paper, more than a year in the making, the doesn’t even try to deal with the issue. It is an absolutely hopeless attempt to look like you’re doing something without actually doing anything at all. The leadership of this country is busy flying first class all over the planet with their entourages, living on champagne and caviar, while their constituents are being beaten and robbed in their homes and the country is losing its competitive edge in tourism and finance. The only difference between being a senior Cayman politician and being on an all-expenses paid international holiday is that as a politician you also get a salary….and a pension…and you get to take your friends. We need leadership on crime NOW. It should be the number one priority of all Cayman’s politicians. They should be throwing every resource available at the problem and actually trying to produce results from week to week, not producing papers that are outof date before they’re finished. If they don’t deal with the immediate crime problem we won’t need a long term strategy because there will be no-one left to rob. Once again the new leader of the PPM is big on complaints but small on answers. His speech would have had much greater impact and power had it contained some solutions. Without the suggestion of some solutions it sounds a bit like hot air. I have one solution, train and arm RCIP officers. 10:53…that is an unfair statement. Mr Bush has morphed the political system into a one man controlled party. The only thing the opposition can do is complain. Bush has the power, he should be taking responsibility and doing something about his countries crime problem. It is not rocket science to fight crime yet he refuses to address the situation. It is not the Opposition’s job to put forward policy proposals for the govt. to follow. It IS the Opposition’s job to hold the govt. accountable when it is failing to carry out its responsibility to formulate and implement effective policies. The point that McLaughlin is making is a valid one – that the report (which is prepared by the experts who should have the solutions) does not address our immediate needs in terms of the crime situation. Each one of us may have an idea of what should be done but that does not mean that the idea is sound or effective to address the issues. 100 percent correct. Mr. Bush and Ms. Oconnor and the UDP will not take responsibility for the countries crime problems. They have allowed crime to get out of control. The country needs new leadership. We need new leadership but we will not find it in the PPM or the UDP! Again you are 100% wrong Lach; it is the Governor who holds direct responsability for the RCIP not elected officials; I realize the urge to criticize the premier is convenient to people like you and CNS=PPM, but come on be realistic, the blame should be directed at the Governor, his teamm the police commisioner etc.. you can only hold people responsable when you have given them a certain responsability and as it is right now the Premier does not have direct responsability for the RCIP. Sachamo……brilliant UDP Bush supporter statement. In one breath Bush wants the perks, the money, the travel, the title of LEADER OF THE COUNTRY. In the other breath he whispers that it is the Governors responsibility. The people who are getting shot and robbed don’t care whose responsibility it is, the people of the Cayman Islands are experiencing crime and violence at a proportion never seen in the countries history and you suggest that you need to point a finga at some one else. This is a pathetic third world politician game and I mean Bush staying out of the fray because its the Gov’s job. Mr. Bush, true leadership and representation is required, so glad you are concerned about children being killed by drive by shootings. This is foolish…..Cayman is better than this….time for true leaders. On the Appointed Day, McKeeva Bush stood before the world and made repeated and pointed reference to himself as "The Defender of the Cayman Islands." Well then, Mr. Bush, defend us. You were not singing that song when it came to the Kernohan helicopter affair. It was all about the elected govt. then. Hypocrite. The Helicopter affair was a whole different issue my learned friend, elected officials are directly responsable for funding and providing resources to the police so offcourse i would had comented about that PPM fiasco! anything else you wish to comment on? It was not a whole different issue at all. They both involve crime fighting strategies by the police. The issue was not the provision of funding but rather the expenditure of the funding which was a matter for the Commissioner of Police and the Governor/Chief Secretary. The elected govt. is more responsible for the crime situation now that it ever was given its status and role under the new Constitution and its key role on the National Security Council. Your comments reflect politically motivated hypocrisy. “Politically motivated Hypocrisy” boy thats the pot cussin the kettle black….take a long hard look in the mirror myfriend! can’t take a good debate like a man or ground woman without insults?…if anything this shows you are a very immature individual. and for the record nowhere does the new consitution give elected officials direct responsability for the policy. You can only hold them responsable for funding, providing resources and for recommending strategy period. My comments are fair. There were no gratuitous insults. I simply pointed out that your comments were hypocritical, and they were. You adopted a politically expedient stance to let one govt. off the hook while nailing the other although the current Constitution allows the current elected govt. some say in national security matters. That is a perfectly valid point to make in a debate, unlike petty personal insults like “you are a very immature individual” given for no reason other than you have no real rebuttal to offer. I say hold each govt. to account to the same standard, and to a higher standard in an area where they have a greater degree of responsibility. Why should anyone listen to your views about who bears responsibility when you cannot even spell the word? For the first time in Cayman’s history the Constitution provides for a National Security Council the principal function of which is to advise the Governor on matters of national security. Previously this was the remit of the Governor alone. The elected govt. has three members on that Council. The Governor is obliged to follow that advice unless he deems it to be contrary to the interests of HMG. ‘recent statistics from the RCIPS showing a decline in overall crime did not reflect the reality of how people felt’ And since when has the way people felt been linked to reality? These are two different things, and if the leader of the opposition cannot get his head round the difference between perception and reality, he’s not going to get much further than Bush. This looks to be an excellent plan fo the future, and Mr McLaughlin needs to stop playing political football with the issue of crime – it’s far too important for that. There are NO quick fixes in this world. Crime has taken years to get to this level, and will, I’m afraid, take years to fix. Anyone who claims otherwise is deluded at best and a liar at worst. Ever wonder WHY the statistics show that crime has decreased when you, I and everyone else living on this island can clearly see that is not the case?? It’s easy to play with the statistics once you know HOW to do it. They played with the numbers to give the public the appearance and therefore false assurance that crime had decreased. In the meantime the CoP is diverting valuable resources (and doing nothing positive for RCIPS morale) to illegally polygraph innocent police officers. Talk about getting your priorities straight? LOL!!!! Don’t worry me lad, foreign uk officers with six-figure salaries and no street knowledge are comin here to rescue Cayman and take home the trophies!